September 10, 2013 0 comments on "5 Fun Cricket Science Experiments for Kids"
Whether you are homeschooling your children or you are looking for a fun activity to do during a school break or holiday, these cricket science experiments are fun as well as educational. To get started you will need to find some crickets. If you can’t find some in your back yard, you can easily find some at your local pet store, where they sell crickets for people to feed their pets. They are very inexpensive, you should be able to get 15 to 20 for just a couple of dollars. You will also need a small terrarium for your crickets. Because crickets can jump, you will need to have some sort of lid for the container so that they cannot get out. You can often find old terrariums at thrift stores and yard sales for just a couple of dollars. They are often used to house small pets like lizards or hermit crabs. Before you place the crickets in the terrarium, place an inch or so of clean sand in the bottom of the terrarium. Next place the crickets inside and place the lid on top. To keep your crickets alive for your experiments, you will need to make sure they have food and water. Crickets only need a small amount of water. They often survive off the morning dew that wet grass provides. You can give them a small amount of water in the lid of a container like a recycled yogurt container. You can also provide water by misting the terrarium with a spray bottle at least once a day. Crickets like to eat foods such as bread and lettuce. Moisten the bread with water before you put it in the terrarium, and replace the bread when it dries out. If you have more than one child and your children would like to keep track of his or her own crickets, then use a non-water soluable paint such as model paint. Use a small paint brush to place a small dot of paint in the color of your choice on each cricket’s back. There are many different kinds of experiments you can do with crickets.A great place to start would be to print out a diagram of a cricket (easily found by searching Google), and have your child label the parts of the cricket. Do a little research about crickets and help your child determine the difference between male and female crickets. (Did you know that you can only hear male crickets chirping?) 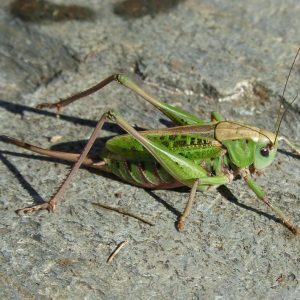 There are many interesting things to learn about crickets and their habits. When you are ready to do an experiment, create a little “house” for the crickets by cutting a toilet paper tube in half. Place a piece of aluminum foil over the end of one of the tubes so that there is only one way in and out of the tube. Place both tubes in the terrarium. One “house” should have two openings, and the other “house” should have one opening. Next have your child write down the hypothesis “I think the crickets will prefer ________”, having them fill in the blank with what they think the outcome will be. Let the crickets do their thing for a couple of hours and then go back and have your child see what the crickets are doing. See if they are in one of the two houses or if they are in neither house. Have your child write down the result of the experiment, and then for the conclusion have them state why they think the outcome occurred as it did. There are many things your child can learn from playing with insects such as crickets. Not only is it fun, but your child is learning important life-long skills that will help them not only in school but also in life.